Every now and again, you will feel a dull ache in your soul. A gentle humming around your heart. A longing for something without a name. Listen to the call of your authentic self. That part of you that lives just outside of your own skin. Let it have its way with you. At first, it could be difficult to move from your own comfort zone, but remember that what is not started today, will not be finished tomorrow. I have learned to take things more slowly, only by then I can know what is good for me and what's not. I have also learned to lean towards what makes me happier, even though at first I hesitate a thousand times, to understand that "no" is a full sentence, and lastly to have a more balanced life. In work phase, I am still in my corporate 9-5 work, but it doesn't mean I would not try a new endeavour. In terms of health, I try my best to always go for yoga regularly, but I will not starve myself to be skinny. Those are baby steps, but i know where I am going. 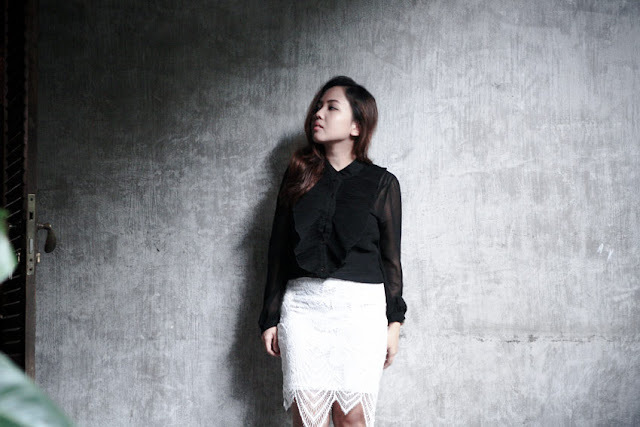 Received this pretty lace skirt from Zaful. Just found out about this shopping site with the latest trendy items that would not burn your wallet. Of course, with all the hype of feminine lace season, I don't mind to own a piece, but I still pick my usual neutral color - white in this case. Some shopping sites are hard to navigate, but I love how clean and user-friendly this one is. Definitely worth to check it out! setuju banget sama statement mbak di atas. Good things take time. followed you on gfc dear!